David L. Frazier Jr., compiler, e-mail address, Frasiers--Virginia to Mississippi, Rootsweb: WorldConnect (online family tree). E-mail written 2006-2009 to Warren Culpepper from Glenda Jo Culpepper Yates (#38556), e-mail address. Joe E Culpepper, born 1920 in MS, White, Single, Education: 1 yr HS, Height/Wt: 71/160; Resided in: Attala Co. Co., MS; Enlisted 25 Nov 1940 at Lexington, MS in Field Artillery. Obituary of Frances Marie Munn Culpepper (#38555), publsihed 25 Mar 2008. 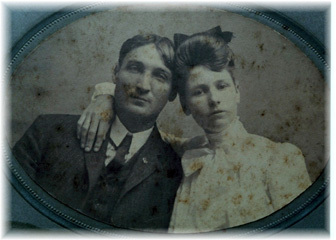 William Earl Culpepper and Claudie Nadine McMullin. Obituary* 25 Mar 2008� Funeral services for Mrs. Marie Munn Culpepper, 80, of Kosciusko will be held Wednesday at 11 a.m. at Culpepper Funeral Home Chapel with burial in Harmonia Cemetery at Sallis. Mrs. Culpepper, a native of Leake County, died March 23, 2008 at the Mississippi Baptist Medical Center in Jackson. She was a member of the Methodist Protestant Church in Kosciusko. She is survived by a son, Ricky (Becky) Culpepper of Kosciusko; two daughters, Cathy (George) Gilreath of Brandon and Glenda (Rickey) Yates of Arlington, Tenn; two brothers, John Munn, Murray Munn, and a sister, Minnie Meggs, all of Kosciusko; three grandchildren, Keith Yates, Shea Culpepper and Rob Gilreath. Rev. Jerry Meggs will officiate. She was preceded in death by her husband, Joe 'Pep' Culpepper; son, Billy Culpepper; and grandson, Joey Yates. E-mail written Jul 2006 to Warren Culpepper from Keith Edward Yates (#54715), e-mail address. , Rootsweb: WorldConnect (online family tree), Jan 2000. From QRZ.com: Amateur Radio License N5RLF, Victor T. Culpepper, Ardmore, OK.
Bob is a retired professor of accounting at the University of Arkansas at Little Rock. 3. James Harold Frizzell, who in March 2011 was serving in the US Army's 25th Infantry Division. 2. Richard Albert Wallis (August 12, 1939 in El Dorado, Ark - January 13, 1990 in Houston, Tx) Buried in Woodlawn Cemetary, Houston, Tx. E-mail written 2000 to Lew Griffin from Donnie F. Frizzell (grandson of James J. & Vera G. Culpepper Frizzell). E-mail written March 2011 to Warren Culpepper from Sr. (gs/o #38571) Donnie F. Frizzell, Franklin, LA, Phone 337-578-3076, e-mail address. E-mail written 6 Jun 2011 to Warren Culpepper from Terri J. Wallis-Meeks (gd/o #38571), Houston, TX, e-mail address. "56 years ago tonight Woodie was crossing the English channel for Omaha Beach. He was in Naval Amphibious Force, small boats. He had been in North Africa, Salerino, and Sicily unloading supplies from liberty ships without much protection. Each officer had three small boats. From Sicily he went back to North Africa and then to England to train for the D-Day invasion. He took troupes ashore at Omaha before unloading supplies. He said the boys were deathly sea sick and no one anticipated the shelling our ships would get. The same LST that took him from N.Africa to England took him from France back to England. "He returned to the US on a ship where he guarded German prisoners. After 30 days leave, and some schooling at the amphibious base at Va. Beach he sailed for Iwa Jima. Spent the remainder of the war there. He said the Japanese suicide planes continued to come in at them even after the war was supposed to have ended. He didn't have many points since he wasn't married so took him along time to come home. E-mail written 2000 to Lew Griffin from Joan C. Ball, e-mail address.